The term 'Patuxent River CPOA' or 'us' or 'we' refers to the owner of the website. The term 'you' refers to the user or viewer of our website. 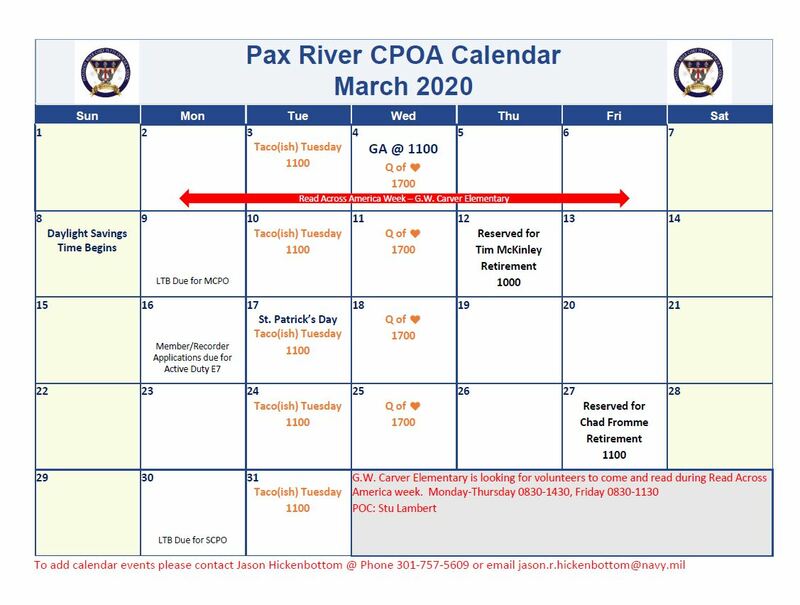 You may not create a link to this website from another website or document without Patuxent River CPOA's prior written consent. This is a secure website. Our Protocol is Hypertext Transfer Protocol with Privacy. Our connection is TLS 1.0, AES with 128 bit encryption (High); RSA with 2048 bit exchange. All information between this website and our server is encrypted. Verification can be made by right clicking on any page then click "Properties". Patuxent River CPOA is committed to ensuring that your privacy is protected. Should we ask you to provide certain information by which you can be identified when using this website, then you can be assured that it will only be used in accordance with this privacy statement. Patuxent River CPOA may change this policy from time to time by updating this page. You should check this page from time to time to ensure that you are happy with any changes. This policy is effective from February 2010. Other information relevant to member surveys and/or offers. From time to time, we may also use your information to contact you for passing information from meetings and events. We may contact you by email, phone, fax or mail. We may use the information to customize the website according to your interests. You may request details of personal information which we hold about you under the Data Protection Act 1998. If you would like a copy of the information held on you please write to [Patuxent River CPOA, P.O.Box 74, Patuxent River MD 20670]. The information contained in this website is for general information purposes only. This website is in no way endorsed by or affiliated with any DOD or Government Agency. The appearance of DOD/Military/3rd Party hyperlinks does not constitute or imply endorsement by the Department of Defense or any other website contained therein. The information is provided by Patuxent River CPOA and while we endeavor to keep the information up to date and correct, we make no representations or warranties of any kind, express or implied, about the completeness, accuracy, reliability, suitability or availability with respect to the website or the information, products, services, or related graphics contained on the website for any purpose. Any reliance you place on such information is therefore strictly at your own risk. Through this website you are able to link to other websites which are not under the control of Patuxent River CPOA. We have no control over the nature, content and availability of those sites. The inclusion of any links does not necessarily imply a recommendation or endorse the views expressed within them. Every effort is made to keep the website up and running smoothly. However, Patuxent River CPOA takes no responsibility for, and will not be liable for, the website being temporarily unavailable due to technical issues beyond our control. This website and its content is copyright of Patuxent River CPOA - © Patuxent River CPOA 2014. All rights reserved. You agree not to publish any abusive, obscene, vulgar, slanderous, hateful, threatening, sexually-oriented or any other material that may violate any applicable laws. Doing so may lead to you being immediately and permanently banned (and your service provider being informed). The IP address of all publications is recorded to aid in enforcing these conditions. You agree that the webmaster, administrator and moderators of this community have the right to remove, edit, move or close any publication at any time should they see fit. As a user you agree to any information you have entered above being stored in a database. While this information will not be disclosed to any third party without your consent the webmaster, administrator and moderators cannot be held responsible for any hacking attempt that may lead to the data being compromised.